Our household has had multiple discussions on proper turning techniques for years. 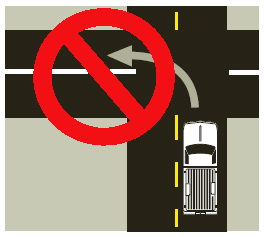 There is one train of thought that says that you must always turn into the closest lane first and then move over. There is another train of thought, the swinging wide party, that says you can go into the lane you want. Out in the world, ie Iowa, both parties have noticed that the majority, say 85% of people swing wide, from regular Iowan folks, other state visitors to police, while few people actually turn into the closer lane first (Especially noticed on one ways). The closer lane first party did their research and happily found out that indeed, the driving code says to yes, pull into the closer lane first, then move over as per General Lane Use. Being that I am the winner, I would like nothing more than to see at least one of these law breaking Iowans actually get a ticket for these rampant traffic violations. However, after being pulled over twice in the last couple years for speeding and getting only a warning, I would be willing to let these constant violations slide without much further consideration. It is just good to know that I am not crazy and everyone really does make these illegal turns all day long. I would like to know what the actual fine is if you were be be given a ticket, though. Turn signals! Yes! That is another frequent topic too! 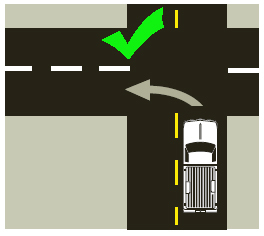 I'm pretty sure that I learned in driver's ed (not in Iowa though) that you are supposed to take the lane that you want when turning onto a two lane road - if its available! Yeah, that must be a other state thing because in the IA DOT handbook it specifically says closest lane... though yesterday, I saw a driver's ed car with student driver who turned very beautifully into the farther lane, what seemed like, on purpose, so who knows, :)! VINDICATED AT LAST. Thank you for posting this. Closest lane FTW!! !